Gold Diamond Circle Earrings from KC Designs. A beautiful crescent shape effect adds character to these unique circle earrings. Finely crafted of genuine 14K yellow gold. 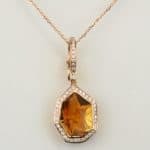 Includes just under 1/2 a carat of small diamonds set into the crescent side of the circle and the post they dangle from. So charming, you’ll want to wear these earrings everyday and you’ll be able to since they are so lightweight and comfortable. Plus, they have great movement dangling from your ears. Equally suitable with your cocktail dress or a night on the town in your jeans and favorite T-shirt.